Do you have a business model based on recurring fees? Do you want to charge subscription fees? Maybe you just want to break down a larger fee in to finance payments. The good news is PayPal offers the tools and functionality for collecting card payments daily, weekly, month or annually through a secure debit card gateway. Customers can pay with their debit card without needing a PayPal account. They use the PayPal gateway as a “guest”. When I say PayPal is secure, I mean SSL is taken care of so you will not need to buy a certificate for your entire site unless there is a good reason to do so. You can set up your debit card billing cycle and automatically collect money from your client’s bank account directly to your PayPal account. Most major cards are accepted. 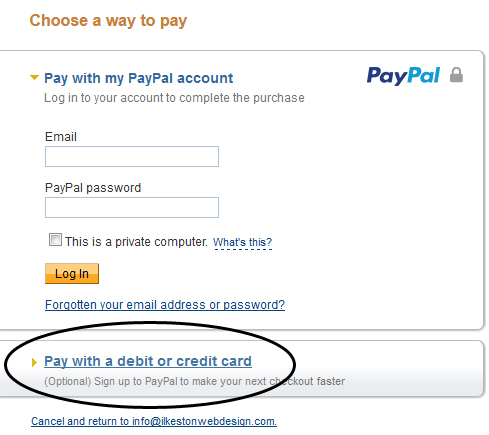 Just to clarify, if your customer is paying with their debit card, they do not need to have a PayPal account. They are simply using the payment gateway as a means to securely use their debit card. Make it clear to your customers that they will not be asked to sign up for a PP account. You might even want to provide a YouTube tutorial video on how to use the system as I did with my local web design service. It saves you repeating yourself. Because personal accounts are for individual use, the features are limited. A business account will be needed instead. Compare the different types of account here. You must upgrade your account to at least a Premier or Business account to accept card payments. A Premier account does not cost anything to set up. You’re only charged when a transaction occurs. That leads me to the next section and everyone’s favourite subject – fees. Every time you receive money through a PayPal Premier account they will charge 3.4% + 20p on any debit card transaction. If you’re outside the UK, check the rates in your country/territory. The fees are pretty low considering the legwork PP put in for you. I mean go ahead and build your own eCommerce solution if you like but you can expect to pay £1000 minimum. If you charge your customer £20, 88p will be deducted. Over 12 months that’s £10.56. The YouTube video embedded on this page walks you trough the creation of website payment buttons. A button is created by entering information into the button creator page and then copying and pasting a chunk of generated code to your webpage. 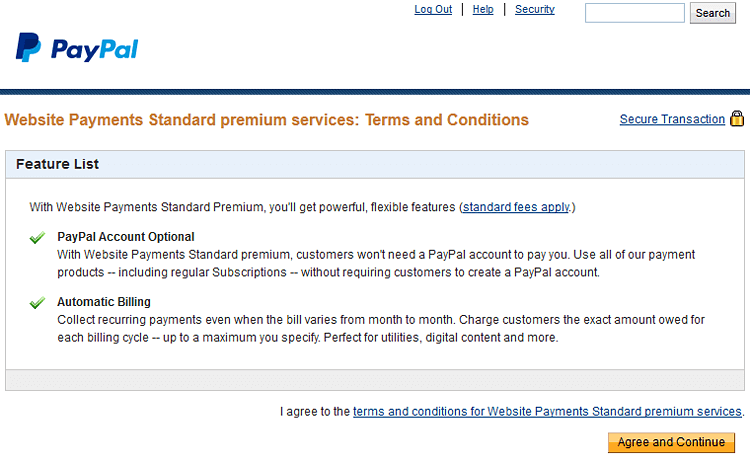 We are interested in the Subscribe button since that is what’s required to bill customers periodically. That is a bit misleading since you WILL need an account to receive payments. Get the appropriate required account before you begin setting everything up. To learn more about setting up the buttons, visit Website Payments Standard: Integration Overview. It’s possible to create a unique link instead of a website button. Think about it. What if you’re charging different customers different prices? 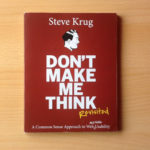 What are you going to do, create dozens of different webpage all with a different button? No, instead of generating a button, you generate a link and email it to your client. Be careful though, these links typically break because they usually get incorrectly parsed. In other words, when your email recipient clicks the link, it will go nowhere and you’ll look stupid. The & symbol (called an ampersand) contained within the link gets recoded as amp; and ruins everything! Update July 2015 – It looks like with PayPal’s separation from eBay, they’ve now changed the terms of Website Payments Standard if a customer is setting up a recurring payment by debit card. They now need to have a PayPal account, where before, they didn’t. I called up the PayPal customer telephone line and spoke to someone called Wayne. I explained that my customers were no longer able to use the PayPal gateway for recurring debit payments unless they had a PayPal account. Basically, they couldn’t use PayPal as a “guest” anymore. This was adding significant friction to the checkout process. I didn’t want my customers to have to be sign up for a PayPal account just to set up a recurring payment. I did some research online before calling and from what I could tell I’d need to sign up for Website Payments Pro at £20 p/m in addition to the usual 3.4% fee + 20p surcharge on each transaction. Wayne asked me if my customers were UK only. Yes, I said. He explained I’d need upgrade my PayPal account to “business” (free) and then sign up for website payments standard premium services. He emphasised that this “standard premium service” is free. Also, I should add, if you’re only collecting one off payments by debit card, these remain unaffected and don’t require website payments standard premium services. I clicked the yellow “Agree and Continue” button, and that was pretty much it! 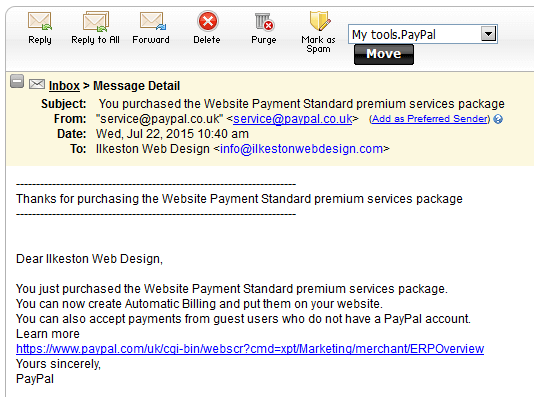 Please don’t be misled by the the line in the email that says “Thanks for purchasing the Website Payment Standard premium services package”. I did not purchase anything. It’s a free upgrade. I thought I should mention all this before you watch the video tutorial, since the video below was recorded in January when things with PayPal were a bit different on their back end. If you’re happy to cough up for Website Payments Pro at £20 per month, you’ll get other features chucked in, but I don’t need any of that stuff; I just need recurring payments without monthly fees but with the usual 3.4% + 20p.